The Importance of Storm Water Retention Ponds. Florida may be known as the Sunshine State, but we sure do get our fair share of wet weather. The storms that come through Florida leave plenty of rain on the ground, but it doesn't always get washed away. This is where stormwater retention ponds come in! 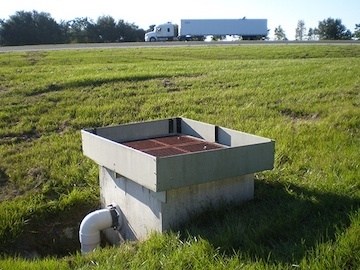 You may have noticed these small ponds on the side of the highway when you're traveling, especially alongside the interstate. What exactly is the purpose of these retention ponds? We'll figure that out and then some for you here! A stormwater retention pond is a body of water where stormwater runoff is collected. Without these ponds, stormwater can cause significant chaos on our local bodies of water (lakes, ponds, rivers, streams, etc.) and our sewer system. 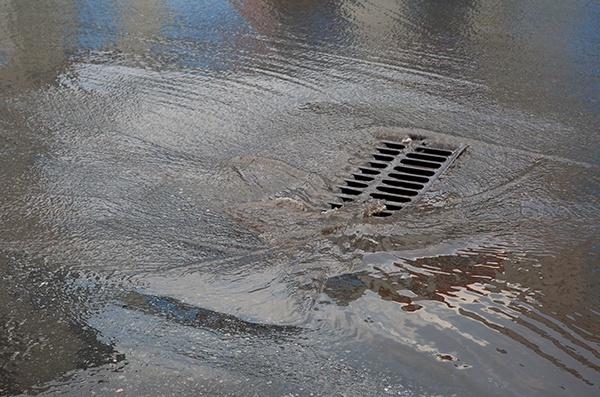 Stormwater can carry some nasty things with it that it comes in contact with after it hits the ground, and these are things no one wants near their water supply or a local swimming area. Especially not something that needs to be introduced into a fragile ecosystem of aquatic life that could be living in these local bodies of water. The retention ponds hold the stormwater runoff and slowly release it in a way that doesn't cause flooding or erosion of any sort. This saves the hassle of having to deal with water runoff that has been through who knows what because you can see where the water is being collected. These ponds also act as a purifier of sorts to make sure the stormwater is no longer contaminated as it is slowly released back into the water supply. This all works through a series of underground piping that collects the stormwater and diverts it to the retention pond that is typically close by. 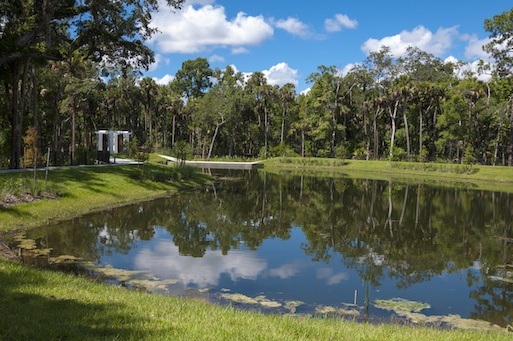 Retention ponds are incredibly crucial in keeping Florida's natural beauty alive and well. Just make sure you don't take a dip in one on a hot day! In Florida, sometimes there’s too much storm to handle during times like hurricane season. There’s so much water everywhere, from lots of rain to storm surges on the coasts. It can be hard to keep up with what’s tagging along in the stormwater running rampant through the streets. This is where corrugated aluminum baffles work themselves in. What is a corrugated aluminum baffle? Like a skimmer, these baffles collect and remove various sediments, debris, and other particles from stormwater. It looks like a long aluminum tube and is relatively simple to assemble, only involving a couple of other components like plates and clips to keep everything in place. How correctly does it work? 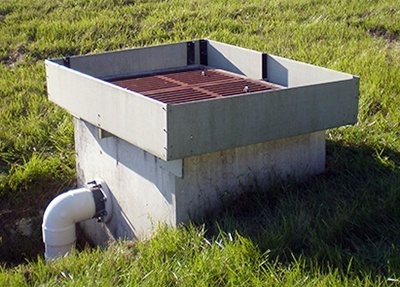 The structure of the baffle keeps oil and grease from making its way down into the French drains and contaminating it. The floatables in the control structure allow for this type of separation in the stormwater. It has already become a popular and successful use in Florida, and they have the storm experience to back it up! Don’t let yourself get baffled this hurricane season. 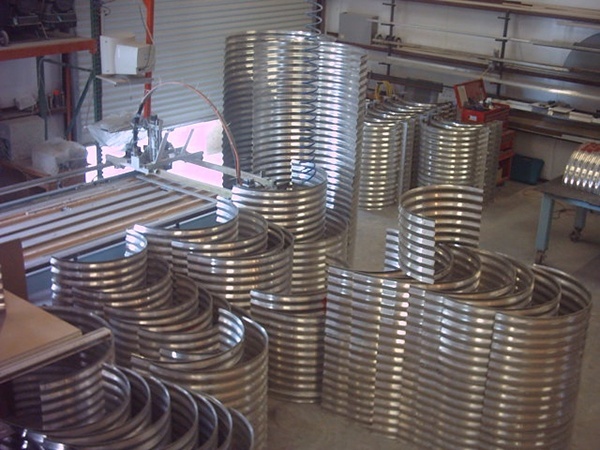 Corrugated aluminum baffles are here to get rid of all the unwanted pieces and parts that travel with the water after the storm. Can molded fiberglass grating hold weight? If you’re looking for reliable flooring in an area prone to liquids sometimes covering walkways, molded fiberglass grating could be the ticket! This type of grating is composed of resin and glass fiber that is kept continuously kept wet and interlaced through a mold to create the grating. But can that hold the weight of heavy machinery and a fully staffed crew at the same time? The durability of the molded fiberglass is incredibly durable and can hold its own under massive amounts of weight and not fracture or break. There is also the option to upgrade to a “High Load Capacity Molded Grating," and this ensures that the heaviest of equipment plus the workforce behind the machines, will be supported. As well as being able to withstand the weight of a fully staffed factory floor, it also gives a non-slip surface to avoid dangers slips and falls. There are two different type of top surfaces; a grit top which is a “quartz grit anti-slip surface” and a meniscus top which is a “concave, half-moon cross section with no grit." It is recommended to go with a top grit top surface as it provides extra safety coverage for hazardous areas. These types of flooring and top surfaces can withstand even the most corrosive of environments. Some of the best places for molded fiberglass grating are paper mills, chemical plants, basically, anywhere that have to deal with chemical corrosion of any sort. This also stands for facilities that work with oils or various other liquids that will undoubtedly come into contact with the floor at some point. The gratings can also range from a small room to an entire floor and more, as well as offering smaller holes in the grating for a handicap accessible option. Investing in molded fiberglass grating will save from costly floor repairs and eliminate a high risk for potential on the job injuries via slips and falls. Protect your work environment today! Stormwater Retention Ponds and Florida's Hurricane Season. Active rainy season and Florida hurricanes cause a lot of damage when water doesn't have somewhere to go. This is why stormwater retention ponds are so essential to our tropical state. Stormwater retention ponds act as basins to catch rain runoff from higher elevation areas. Stormwater retention ponds are often created near new building developments and in many instances, are a requirement for the new building, parking lot and road development. While often overlooked in single family home residential areas, stormwater retention ponds are beneficial in these areas where the retention ponds capture stormwater runoff from damaging streets, driveways, and sidewalks. 1. They retain the runoff before releasing it into natural bodies of water, allowing the water to release at flow rates similar to those that exist in nature. 2. They provide pollutant removal through settling and biological uptake. 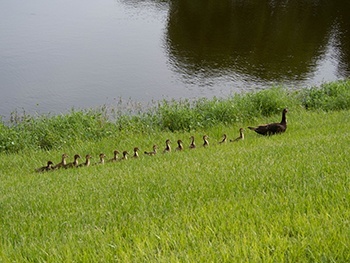 For these two purposes to be accomplished as efficiently as possible, vegetation in stormwater retention ponds must be kept at heights that allow inspection. Stormwater retention ponds are among the most efficient, popular means of providing stormwater management throughout the entire United States. Florida, with a six-month rainy season and active Hurricane seasons, is at the top of the list for needing stormwater solutions the most. 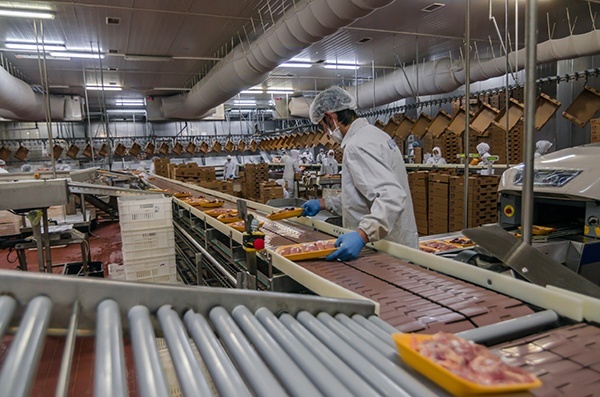 Food processing facilities and environments can end up being a pretty messy place. When working in that kind of atmosphere, you’re going to have to deal with spills or any general mess getting on the ground that everyone walks on. With for a food processing plant, the ideal flooring situation would have to be one that was durable, easy to clean, and wouldn’t create a hazard for employees. Right off the bat, we know carpet and linoleum are out of the question. So what kind of material is best for that work environment? Fiberglass. Fiberglass materials are the most efficient in plants, specifically food related environments. The floors are typically made up of fiberglass grating, with is a mixture of fiberglass and resin. This creates a durable and robust material that can withstand a great deal of weight and pressure without cracking or breaking. Some containers are made from fiberglass materials as well because they are non-corrosive. They can also withstand high and low temperatures, meaning they can be used in a deep freeze or to hold a hot substance. Cleaning these materials is a breeze because all it takes is a high power water hose and a floor drain and you’re done. In a food processing plant, messes are going to be inevitable. Someone in some area is going to spill something, and it’s going to make a mess. Along with being easy to clean, it also poses no risks to employees and guest of the facility alike because of the fiberglass’ non-slip surface. It allows for grip in even the slickest situations. One of the best parts of all is that fiberglass materials aren’t expensive to install at all! The materials come with a low installation cost. Which when compared to installation plus shelf life of other materials such as stainless steel; it seems like a no-brainer! Bringing fiberglass materials into a food processing environments is the perfect fit. Knowing you’re working in a safe and sturdy environment is tremendous peace of mind to anyone. A lot of jobs require particular attention to where employees are at all times to ensure safety, the floor. These types of jobs fall into several industries such as dairy/food processing plants, water/wastewater treatment, chemical plants, and cooling towers, to name a few. We offer one-of-a-kind fiberglass platforms for these industries for use as walkways and catwalks throughout the facility. What makes our platforms stand out from the rest? 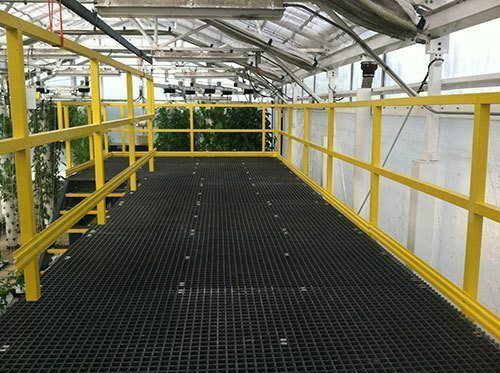 Our fiberglass platforms are an easy to assemble and easy to maintain system of walkways. The walking surface itself is entirely non-slip, allowing to make up for where a non-slip uniform shoe could fail. The handrails are lightweight along with the platform itself. This is because they are constructed of fiberglass reinforced plastic that is regulation and completely safe, not to mention free of any maintenance. After any platform is manufactured custom for the buyer, it is tested to ensure the quality before being delivered. This gives our customers the security in knowing they are buying a top quality product that has been tested to the limit to ensure it will live up to their purpose. When all is said and done, and the product is ready to be shipped out, the customer is again benefited by our use of lightweight, yet sturdy, materials by saving on the shipping costs to get them ready to assemble platforms to their destination. Please contact us at (352) 343-3449 or use our convenient online contact form to discover how you can get our platforms in your building today. Manatees, Florida’s gentlest giants, are naturally curious animals. Sadly, though, their curiosity often leads them into precarious situations. When manatees travel into waterways containing stormwater treatments or large vessels, they become trapped, injured or killed. By installing gates to protect manatees in Satellite beach, rescuers were able to rescue 19 manatees and return them to safety. 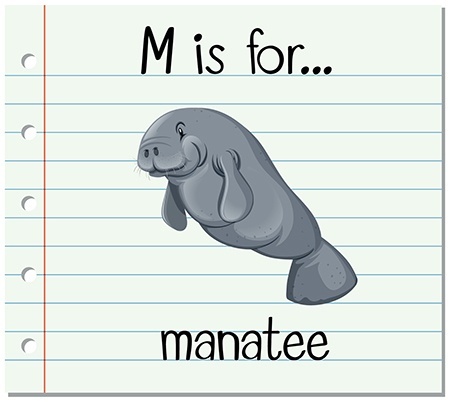 Manatees are unable to tolerate water with temperatures of less than 68 degrees for extended periods of time. When they get stuck in water that’s too cold, their skin breaks into white patches and lesions and their bodies begin to shut down. Because a majority of manatee fatalities are directly attributed to water control structures, manatee grates ensure that systems continue operating uninterrupted while simultaneously protecting these treasured creatures. Manatee gates are custom fabricated using steel, stainless steel, or aluminum, depending on specific need. 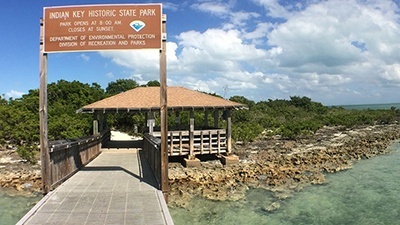 Click here for more information on manatee gates. What are Fiberglass Reinforced Plastics? Fiberglass Reinforced Plastics are made up of synthetic resins that are thermoset (a process that permanently sets material using heat) and fiberglass. Usually pliable, malleable or liquid before being cured, thermoset resins are then designed to be molded into their final desired shape. Once hardened and molded into their final shape, these resins cannot be reheated or melted and shaped differently. Fiberglass Reinforced Plastics are lightweight and exceptionally temperature resistant, but when it comes to resisting corrosion from weather and the elements, Fiberglass Reinforced Plastics really stand head and above any other material. The application and processes for the final product depends on the type of veil and type of glass selected. You’ll want to choose materials that are most wind resistant, water resistant and corrosion and temperature resistant. Stormwater skimmers are not something that most think of, but it holds a very important job. These are commonly found in retention ponds, and their purpose is to stop contaminants (such as oil, grease, and other floating factors) from getting into our natural bodies of water. As stated earlier, the location of these is commonly in retention ponds, which are usually placed in a large grassy area. Due to the typical maintenance of the land, specifically mowing of the grass, this has caused damage to many skimmers thanks to the tractor mowers used. This has become a constant problem and always causes breakage some way or another, so how can it be fixed? The solution is easy; it’s the iSkimmer. So what exactly is the iSkimmer? It is a structural fiberglass polymer angle that bends and contours with that abuse from the mower, and springing back to its original shape with hardly so much as a couple of scratches. Traditionally skimmers made from fiberglass have had rigid angles, not allowing for any give when it comes to a potential impact. The iSkimmer absorbs the impact and pops itself back to its normal form seconds after collision, time and time again. This type of skimmer will last for years and years to come, still withstanding blow after blow be it mowers or something else. The most damage it can construe will be purely cosmetic ( a few scratches here and there, a dent or two – maybe). But that type of damage willhave not affecton the durability and flexibility of the iSkimmer. To know that our natural bodies of water are safe from unwanted additions, thanks to the iSkimmer, is a good feeling. Remember that next time you’re enjoying a warm day out on the water and take the time to see how clear the water is. Faulty, cracked, and broken stormwater skimmers will make our waters murky and unsafe. iSkimmer will keep your summertime fun crystal clear! Nothing beats a solid, sturdy, barefoot-friendly pier or dock for a relaxing day by the water. As Floridians, we’ve all seen the damage hurricanes and strong storms can do to typical wooden docks, and for many, we’ve paid a huge price. Many victims of Hurricane Irma are still working to repair damage to their piers and docks, months after the hurricane. Fiberglass docks and piers combat the problem of devastating and costly storm damage through the use of storm surge grating. This highly durable and economic solution guarantees quick, unfettered access to waterways no matter what the weather throws at you. Fiberglass decks and piers are also a lot more attractive than wooden ones. Wooden decks or piers are susceptible to mold, mildew, wood rot, and deterioration, while fiberglass ones are built to last, no matter what environment they’re in! What is a storm surge grating? In areas prone to severe weather, docks and piers often suffer substantial damage from storms. Storm surge grating is a way to combat this problem using fiberglass grating material to construct hurricane-resistant docks and piers. Storm surge grating is custom made to fit individual piers and docks and the environment they’re in. Grating made to withstand storm surge is designed and installed to meet government regulations and comply with the results of tide and wave studies. It provides the most economical and most durable solution for access to waterways. When fiberglass grating is used instead of deck boards, the damage following a strong storm, or even a hurricane, is minimized - making clean-up and repair much quicker and easier. As a bonus, fiberglass storm surge grating is attractive, durable and great for bare feet! Fiberglass skimmers are "theft resistant"
In years past, skimmers were made from materials that - due to their recyclable “scrap” value - were attractive to thieves. Over 16 years ago, however, the first Enviro-Glaskimer was installed. Fiberglass skimmers have no residual scrap value, and therefore they are still on the job today, protecting the quality of our water in Florida. 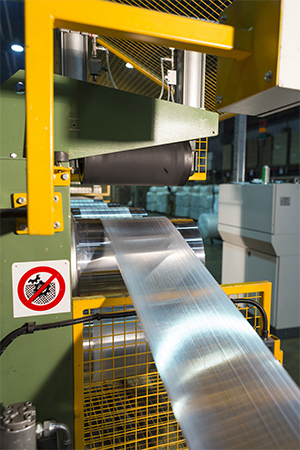 Enviro-Glaskimer production has since expanded even further to include aluminum, steel, galvanized steel and corrugated aluminum skimmers and baffles. Additional product lines now include manatee gates, trash screens, trash racks, fiberglass ladders, walkways, platforms, flap, slide and shear gates and guides, corrosion resistant pump tables, pump shelves and splash shields for water and waste water treatment plants as well as miscellaneous aluminum and steel fabrication. Making the change to fiberglass skimmers has not only helped the environment but also cut down the cost to taxpayers in the form of loss, making it an all around beneficial solution for our entire community. Storm Hardened Fiberglass Surge Grating endured the thrashing of Hurricane Irma as it landed at the boat dock and deck at an 8 Million dollar house in Key Largo. The house, dock, and deck survived with minimal damage attesting to the theme of “do the right thing always” with Enviro Fiberglass Surge Grating. Along with Hurricane Harvey, Irma set records with her power, and the devastation she left in her wake. Irma destroyed more than 90% of the structures on Caribbean islands and left thousands without homes. Hurricanes affect and alter every ecosystem they pass through including both land and sea. Now that Hurricanes Harvey and Irma has passed, scientists are taking stock of the damage to understand what’s happened, learn from it and learn to be more resilient in future scenarios. As Hurricane Irma pushed over land, it poured water into lakes, streams, and rivers. When these waterways swelled and overflowed their banks, they engulfed roads, destroyed homes and bridges and sent animals scrambling to reach higher grounds. Alligators migrated to escape the cold rainwater rush - they got flooded out of their homes and had to evacuate too. Researchers are conducting studies each year to gain a baseline with which to compare water pre-disaster and post-disaster and test for bacteria, carcinogens, and contaminants. Officials are concerned that Hurricane Irma could have spread pathogens like typhoid and cholera as well as hazardous chemical runoff. Meanwhile, rivers themselves are reshaped by water cutting into their banks, flinging rocks and sediments around and carrying trash and branches. Because these issues cause oxygen levels in lakes, rivers, and wetlands to drop, fish begin to die. 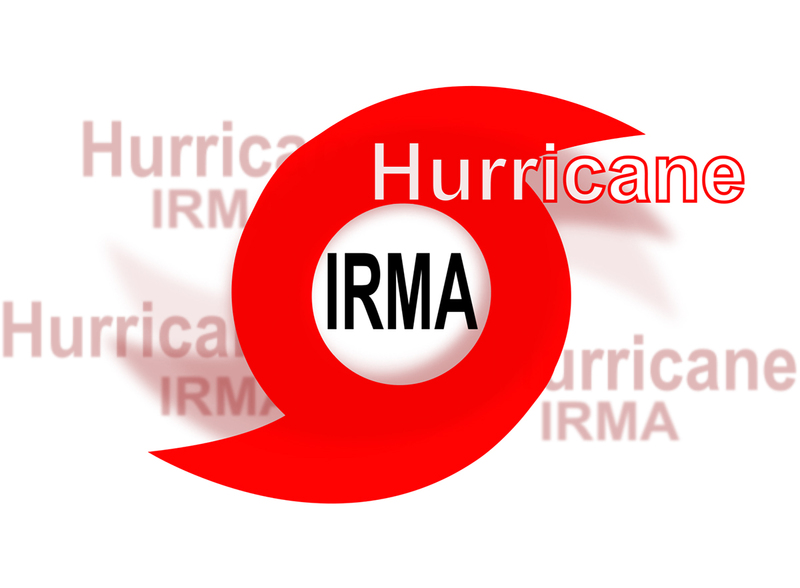 It is too soon to know how long it will take the ecosystem to recover from Hurricane Irma, but officials are working hard to gain knowledge to protect the safety of our communities. Retention ponds or "wet ponds" are ponds constructed to treat and store stormwater runoff. Retention ponds are permanent pools of standing water and eventually empty into a receiving water body. Forebays can be included in the design of a retention pond to "pretreat" the stormwater before it spills over into the major water feature. Water is treated through sedimentation and nutrient uptake. So what exactly is fiberglass reinforced plastic (FRP)? Technically speaking, it is a polymer matrix combined with fibers, glass being most common (but it can also contain other fibers such as basalt, carbon, or aramid). Combining these ingredients makes for a very strong and very inexpensive end product. FRPs are made in a mold, or a tool is used to place the fiber before it forms. The fibers are then covered in a resin to adhere to the mold’s shape. There are various methods that can be used to achieve whatever outcome is desired, all of which need heat and pressure to mold the fibers into place. The products produced are of a minimal weight and a heightened strength. FRP has become so increasingly popular that even vehicle designers have looked into developed future automobiles with the strong fibers seeing as the strength of them outweigh that of some metals. FRP is also completely lacking any magnetic attraction, so it guards against any of electrical spark that could be a potential danger. 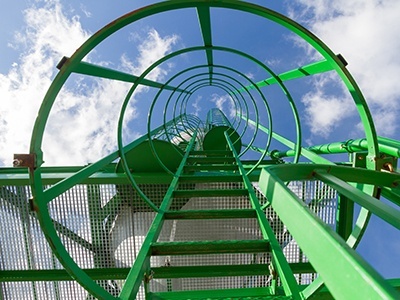 On top of resistance from electrical accidents, FRP is also immune to rotting, infestation, and corrosion. This makes it perfect for anything outdoors, or in a type of workshop or laboratory. It can even hold up in subzero temperatures!